If you’re on the east coast of the North Island during this spring and summer, the Department of Conservation would like your help! Please look out for wild plants of the striking, red-flowered kakabeak. Department of Conservation’s blog post “Keep an eye out for kakabeak”. 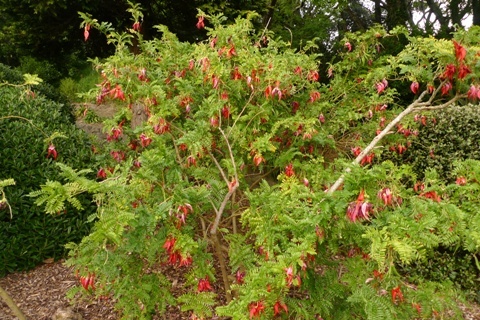 Kakabeak (kowhai ngutu-kākā, Clianthus maximus) in cultivation in Wellington. Photo © Leon Perrie. 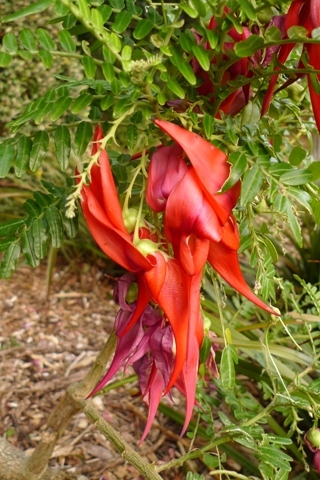 Kakabeak (kowhai ngutu-kākā, Clianthus maximus) is now Critically Endangered. Its biggest threat is introduced browsing mammals, particularly goats. There are only about 150 wild plants from East Cape to Waikaremoana to Hawke’s Bay. The Department of Conservation would like to find more, and protect them. There’s a predictive theory in conservation that the bigger the population, the more genetic variation it will have, and therefore the more robust its chances of long-term survival, particularly in the face of environmental change. Flowering time is the best time to spot kakabeak, with its vivid red flowers allowing it to be spotted from a distance! While kakabeak plants are common in cultivation, their genetic variation is of course only a subset of the known wild plants. The Department of Conservation hopes to find more wild plants. 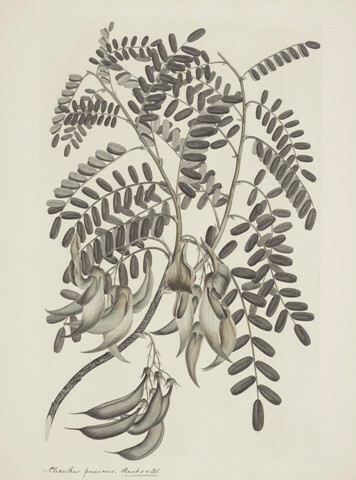 Kakabeak is a relative of kōwhai, in the pea family of flowering plants. New Zealand Plant Conservation Network’s page on kakabeak, Clianthus maximus. Amongst Te Papa’s collection is a specimen of kakabeak collected by Joseph Banks and Daniel Solander during Captain Cook’s first expedition to New Zealand, 1769-1770. This belongs to the closely related species Clianthus puniceus. This kakabeak species is presently even rarer in the wild, known from a single island in Kaipara Harbour. New Zealand Plant Conservation Network’s page on kakabeak, Clianthus puniceus. There is also a black and white engraving based on a drawing by Sydney Parkinson during that voyage. Kakabeak (kowhai ngutu-kākā, Clianthus puniceus). Based on a drawing by Sydney Parkinson, 1769-1770. Printed 1895. Gift of the British Museum. Te Papa, 1992-0035-2353/1527. Te Papa’s Collections Online page on the Banks and Solander black and white engravings. Banks and Solander collected many plants while they were in New Zealand, but didn’t venture far inland. Māori valued kakabeak as an ornamental, so it is possible that Banks and Solander collected their specimen from a coastal village during their visits to the north-east of the North Island. Landcare Research’s Māori Plant Use Database page on kakabeak. Alongside keeping your eyes peeled for kakabeak for the Department of Conservation, Te Papa will soon be asking you to search for spiders and ferns. This December, we’ll be opening the DeCLASSIFIED! Nature’s secrets exposed at Te Papa. This will showcase some of the recent discoveries by Te Papa’s scientists. But we’ll also be asking you to share your discoveries of spiders and ferns in an accompanying citizen science programme, using the NatureWatch NZ website. Stay tuned! The citizen science website NatureWatch NZ, for discovering and recording nature. I have a large and prolific kakabeak bush, seems to be around the dimensions shown. I grew it from a plantlet bought at a school plant sale in Pauatahanui 2 years ago. should I be retaining seed pods? Feel free to grow plants for the gardens of family and friends! It’s such a lovely plant, that I’m sure it will be appreciated. Although I’m not directly involved, I suspect those managing wild kakabeak populations are focused on propagating material from plants known to be from particular wild populations. This will help them manage the genetic integrity of remaining wild populations, and prioritise their efforts to the populations needing the most help. What spiders are you looking for? Our arachnologist Phil Sirvid will be interested in all and any spiders seen in New Zealand. We’ll be running a citizen science programme on the website NatureWatch NZ (http://naturewatch.org.nz/), inviting people to upload their photos of spiders they see. Phil will then help with identifying the spider. More details to come. Very sad to read this Leon. Had no idea this beautiful plant was on the critical list. 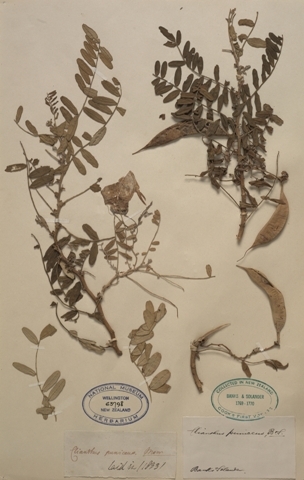 TP does have two coloured copies of the original engraving of Clianthus puniceus – one in Botany and one in the Print Room. Very interesting, thanks for showing us the treasures from Te Papa.